RIDING OUR TRAIN is one of those pinch-me moments. It’s as iconic as taking afternoon tea at the Ritz or strolling along the Seine with your lover. 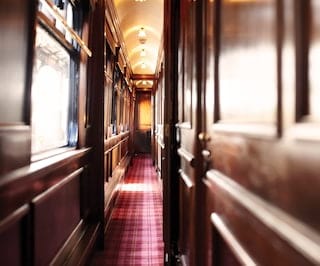 Running since 1985, Belmond Royal Scotsman ranks among the world’s most luxurious trains. Our mahogany-clad cars marry Edwardian elegance with the comforts of a country house. Running April to October, our journeys range from one to seven nights. The classic five-day, 720-mile round-trip ventures to the heart of the Highlands. Alternatively, opt for a themed expedition such as the Scottish Golf Tour. 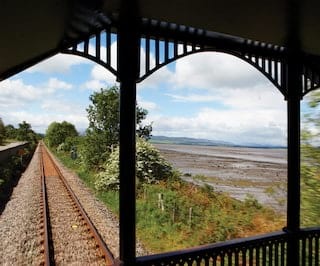 No matter the route, Belmond Royal Scotsman is a palace on wheels. Boarding passengers get the red carpet treatment—quite literally. A crimson walkway is rolled out to the airs and tunes of a piper in full Highland dress. A silver salver of champagne flutes awaits. With just 36 guests and 12 members of staff, intimacy and personal attention are guaranteed. It is a unique and unforgettable experience. Cross the Forth Bridge, journey over the Glenfinnan Viaduct. For mile after mile, enjoy the sight of pine-clad mountains mirrored in glassy lochs. From the detailed marquetry to the handwritten names of guests above each door, our suites are an ode to the golden age of travel. Our Observation Car is the train’s social hub. It’s all plush lounge chairs, conviviality and complimentary drinks—the bar carries some 30 types of whisky. Head onto the open deck for fresh Highland air and panoramic views. Deer lift their heads as the train ambles by. Onboard, passengers raise a glass in response. Days are filled with travel and excursions. Enjoy a morning clay pigeon shooting or fly fishing. Take a Highland safari before lunch and later visit a laird’s estate or a whisky distillery. Onboard, retreat to our airy, wood-clad Bamford Haybarn Spa car. Unwind with botanically inspired holistic treatments as the drama of the Scottish landscape unfolds outside. Dinner is an elegant, candlelit affair. Men often wear tuxedos—or a kilt, of course. 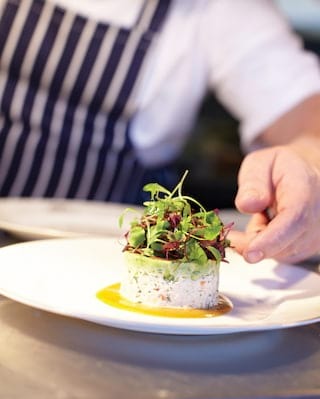 Over plates of world-class, regional cuisine—oysters from the Kyle of Lochalsh, Aberdeen Angus beef, Inverawe smoked salmon—stories are swapped and songs sung among merry passengers. ‘Life is the train,’ wrote Paulo Coelho in his novel Aleph, ‘not the station.’ We couldn’t agree more.